I am not really sure how to even review these books without spoilers! This is a three book series that you cannot read out of order. It is also not one that you can only read the first story. You need to read the entire trilogy. It’s really one story told in three books. 😉 This series has the Best. Villain. Ever!!! I mean EVER!! I so didn’t want him to be a villain. He was AMAZING! That is all I can really say without giving anything away! What I hated: I cannot tell you or I’d seriously be into major spoiler territory! I know! I know! Horrible! But I just can’t. I will say there was a thread to the story that I wish I would have had a more complete picture of. NOTE From Deb: This series is older and many of us are eagerly awaiting new stories from the author. Until they, they tend to be re-read! 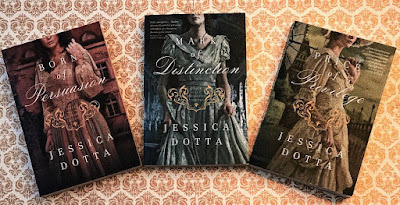 This Collection combines all three books in Jessica Dotta’s historical-romance Price of Privilege series into one volume for a great value! 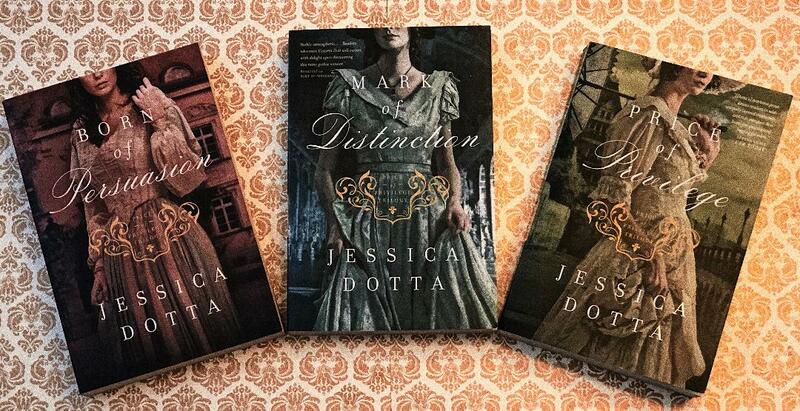 The year is 1838, and seventeen-year-old Julia Elliston’s position has never been more fragile. Orphaned and unmarried in a time when women are legal property of their fathers, husbands, and guardians, she finds herself at the mercy of an anonymous guardian who plans to establish her as a servant in far-off Scotland. With two months to devise a better plan, Julia’s first choice to marry her childhood sweetheart is denied. But when a titled dowager offers to introduce Julia into society, a realm of possibilities opens. 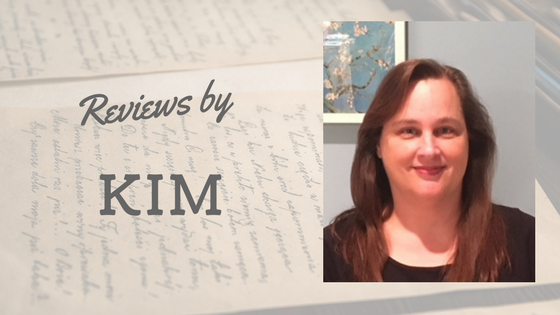 However, treachery and deception are as much a part of Victorian society as titles and decorum, and Julia quickly discovers her present is deeply entangled with her mother’s mysterious past. Before she knows what’s happening, Julia finds herself a pawn in a deadly game between two of the country’s most powerful men. With no laws to protect her, she must unravel the secrets on her own. But sometimes truth is elusive and knowledge is deadly. London is said to be the glittering jewel of society, a world unto itself—but to Julia Elliston it is a city of shadows. Her life is swiftly dissolving into scandal. And in Victorian society, even a whisper of scandal—substantiated or not—can be the death of a young woman’s reputation. Now under the watchful eye of Lord Roy Pierson, one of most influential men in England, Julia begrudgingly accepts his protection. But Chance Macy’s power is far-reaching as well, and he is eager to assert his claim over her. Thrust into society as the Emerald Heiress, Julia is the toast of London, a celebrated curiosity. But in reality she’s trapped between the clutches of two powerful men. Aided only by a gentleman whose intentions she prays she can trust, Julia must finally take control of her own fate—but outwitting one’s foe rarely goes according to plan. Having finally discovered the truth of her birthright, Julia Elliston is determined to outwit Chance Macy at his own game. Holding a secret he’d kill to keep, however, is proving more difficult than she imagined. Just when Julia thinks she’s managed to untangle herself from Macy’s clutches, he changes tactics with a risky ploy. As the scandal of the century breaks loose, drawing rooms all over London whisper what so far newspapers have not dared to print: Macy’s lost bride is none other than Lord Pierson’s daughter—and one of the most controversial cases of marital law ever seen comes before Victorian courts. Though Julia knows Macy’s version of events is another masterful manipulation, public opinion is swaying in his favor. Caught in a web of deceit and lies, armed only with a fledgling faith, Julia must face her fiercest trial yet. I've re read this which makes it even more fun to see the nuances you miss the first time. That's good deep storytelling. I LOVE a deep twisty plot full of the unexpected. And Julia is such an interesting heroine. You won't know who to believe at times. Even your own judgement! I absolutely loved this trilogy. I need to reread this( if I didn’t have other books on a deadline to be read) . So memorable, so deep and intriguing. It is best to read them all at once. I agonized because I read them as they were published, too long in between! I’ll say it again! Ms Dotta needs to write more books! Thanks, Kim. We are in the same fanclub!